Along with the Academy Awards that honor the BEST in film, the GOLDEN RASPBERRY Awards honors THE WORST in film. Johnny Blaze made a deal with a devil named Mephistopheles in order to cure his dying father. But that deal cost him his soul. And now, he has become the devil's bounty hunter. At night, in the presence of evil, Johnny Blaze transforms into the hellish being known as The Ghost Rider, and his first major bounty is to destroy the demon known as Blackheart and his minions. GHOST RIDER is an adaptation of the Marvel comics series of the same title. Since I grew up with comic books, I am a big fan of comic book movies. And of course, I was excited to see the GHOST RIDER movie adaptation. Sure, I lowered down my expectations because the storyline of "Ghost Rider" has been used and overused in numerous films with vaguely similar storylines. I expected for it to be a movie loved with the highest tolerance to criticism. But a disappointing film is a disappointing film. And if it has too little redeeming factors, then there's no reason not to talk about it. Don’t get me wrong, GHOST RIDER would not necessarily make you feel like you’re throwing away your money on crap. GHOST RIDER has its moments of utter coolness. The fiery transformations with gothic angelic chorals on the background, the bits of humor, that hellishly radical bike he rides. I would not have even cared if the storyline would be considered over-used & cliché, because I already did expect that. But just the overall delivery of the movie itself was purely bland. The movie was fun but disappointing. It's no surprise, this film was directed by Mark Steven Johnson, the same guy who directed the Daredevil movie, which also could be considered a failure. well, I guess that's STRIKE TWO! & I don't want to see him directing a superhero/comicbook adaptation movie again. I can appreciate Daredevil with the highest tolerance, and would admit to liking it a little. But it still goes out the same that it was crap, & badly needed to fall on a new director. There was no question of the choices for Nicholas Cage to be Johnny Blaze, Peter Fonda to be Mephistopheles, and Eva Mendes to be Roxanne Simpson. They are all superior performers, and very fitting for their roles at that. But the script never seemed to work well with the direction of the film. Many of the lines looked cheesy, mostly due to the editing which had bad timing and monotony of angles, so much so that Nicholas Cage's supposedly memorable lines end up looking like scenes from a bad B-movie. Same with Peter Fonda, who by the scarcity of film projects made him look like a struggling has-been in this movie. There were moments when Eva Mendes was comedically adorable. But her charm (that usually leaves me lovesick) could not save her from ending up looking like a cheap "face" in a sad project. At least Wes Bentley was spunky for the role. But his entire look for the film did not carry on a sense of overwhelmingly cool villain. His costume looked like he was spoofing each and every cliché from each and every badly-made superhero and vampire movie. His hair & make-up looked more metrosexual than demon, he could not intimidate me and I swear I could easily ward him off with smelly feet and a bad fashion sense. The fight scenes were pathetic. Sure, the "minion" villains known as The Hidden were cool. But the fighting scenes with them did not excite me. In action movies, nothing's new these days when it comes to fight scenes. But one should at least make it either interesting or at least sensible for the audiences to get a sense of response. Many of the fight scenes in this movie makes you end up mumbling "Huh? ", "What?!" or "Anu tu ya kuno?!" It's as if some characters were too dumb to stand and wait for a punch to hit them. Giving it credit, the film does make the effort to breakthrough with some kind of originality (with scenes like how he beat his enemy made out of the wind), the problem is, they don’t really convince me, as far as I’m concerned anyway. CGI or Computer animation is this movie's main Ace card. The thing which it heavily relies to. But one should not really be strict in CGI judgment because in the long run, this technology will get old. It is actually how a film uses its technology to create a good movie. 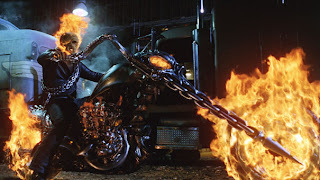 Ghost Rider may have fabulous CGI, but there isn’t too much innovative and impressive scenes for it to be a step ahead of the usual eye candy. I cannot deny that there were moments when this movie made me laugh and cheer. But overall, it was a failure, that will stand aside other disappointing classics such as Blade Trinity, Daredevil, and a bit better than that awful Spawn movie adaptation. Oh well, I hope a sequel with a new director could redeem it.